Pianist Cecil Taylor, a pioneer of free jazz and icon of the avant-garde for more than half a century, died April 5, 2018 at his home in Brooklyn, N.Y. He was 89. Taylor's legacy is his sound: He played the piano with a furious attack, using the entire range of the instrument to create a unique musical language. His approach inspired other musicians and he remained true to it, even though it meant a lifetime of financial struggles. Cecil Taylor was born March 25, 1929 and raised in Corona, Queens in New York City. He began playing piano at the age of 6, and he said his mother made him practice six days a week. which eventually led to studies at the now-defunct New York College of Music and Boston's New England Conservatory. In 2012, the reclusive then-83-year-old sat in his Brooklyn townhouse to talk with NPR, chain-smoking. He rasped through his missing lower front teeth that his first influence was the humor and sparkling stride piano of Fats Waller. "Fats — very funny man," Taylor recalled. "But every note that he played was like a pearl." When Taylor formed his own band in 1956, he used his classical training to go beyond the jazz tradition. Taylor stretched the beats in a measure and played notes outside the chords of a song. "Cecil is of jazz, and also beyond it," says Ben Ratliff, author and former jazz critic for The New York Times. Ratliff says Taylor was always ahead of his time. "The thing that Cecil was doing in 1959 or whatever, the stuff that had basically a steady beat, but was pushing out on all sides with strange harmonies and strange dynamics — you know, we're doing stuff now that's more like that. And to think that at that point in the late '50s, Cecil Taylor was just saying, 'Yeah, this is the right way to play, this is the way to do it,' is truly amazing." In the early 1960s, trombonist Roswell Rudd performed and recorded with Taylor. Rudd said in a 2012 interview that we wouldn't have the music we have now if it had not been for Cecil Taylor. "I've played with, and been in the same room with a lot of great pianists," Roswell said, "but Cecil had that power in his sound to project into people. He could really turn things inside out. I mean, there was such a mind going on there." Cecil Taylor said he always strove to leave his audience breathless, an approach he said he adopted after he saw Billie Holiday sing for the first time when he was 16 years old. He was captivated by the gardenia in her hair, her long white gloves and the sound of her voice. "The first thing you saw on the left side of her head was these gardenias," Taylor recalled. "The gloves, white, came above her elbow. The body all in white. The fur flowing. And when she started to sing, the right elbow would be bent, and the left leg dipped. And I said, 'Whoa.' And the next day I said to myself in my kitchen, 'What that woman did to me, if I ever grow up, that's what I'd like to do to the audience.'" For more than 60 years onstage, Cecil Taylor did just that. "When you play, when you perform, it might be for the last time," he said. "So you got to do it." Cecil Taylor's driving percussive piano led the way to a new style of jazz in the 1950s. It was called free jazz. It broke all the rules. The way Taylor played it inspired other musicians and fans for decades. Cecil Taylor died yesterday at his home in Brooklyn. He was 89 years old. Tom Vitale has this appreciation. TOM VITALE, BYLINE: Cecil Taylor's legacy is his sound. He played with a furious attack, using the entire range of his instrument. And he created a unique musical language. VITALE: Cecil Taylor was born in 1929 and raised in Corona, Queens. He began playing piano at the age of 6. He said his mother made him practice six days a week, which eventually led to studies at the New York College of Music and The New England Conservatory. When he was 83, the reclusive musician sat in his Brooklyn townhouse, chain-smoked and rasped through his missing lower front teeth that his first influence was the humor and sparkling stride piano of Fats Waller. CECIL TAYLOR: Fats was a very funny man, but every note that he played was like a pearl. VITALE: But when Taylor formed his own band in 1956, he used his classical training to go beyond the jazz tradition. Taylor stretched the beats in a measure, and he played notes outside the chords of the song. BEN RATLIFF: Cecil was of jazz and also beyond it. VITALE: Ben Ratliff is the former jazz critic for The New York Times. He says Cecil Taylor was always ahead of his time. RATLIFF: The thing that Cecil was doing in 1959 or whatever, the stuff that had basically a steady beat but was kind of pushing out on all sides with strange harmonies and strange dynamics, you know, we're doing stuff now that's more like that. And to think that at that point in the late '50s Cecil Taylor was just saying, yeah, this is the right way to play, this is the way to do it, is truly amazing. VITALE: In the early 1960s, Roswell Rudd performed and recorded with Taylor. VITALE: The late trombonist said in a 2012 interview that we wouldn't have the music we have now if it had not been for Cecil Taylor. ROSWELL RUDD: I've played with and I've been in the same room with a lot of great pianists. But Cecil had that power in his sound to project into people. He could really turn things inside out. I mean, there was such a mind going on there. VITALE: Cecil Taylor said he always strove to leave his audience breathless, an approach he said he adopted after he saw Billie Holiday sing for the first time when he was 16 years old. He was captivated by the gardenia in her hair, her long, white gloves and the sound of her voice. TAYLOR: The first thing you saw on the left side of her head were these gardenias. The gloves, white, came above her elbow. And when she started to sing, I said, whoa. BILLIE HOLIDAY: (Singing) Good morning, heartache, you ole gloomy sight. Good morning, heartache, thought we said goodbye last night. TAYLOR: And the next day I said, what that woman did to me, if I can ever grow up, that's what I'd like to do to the audience. 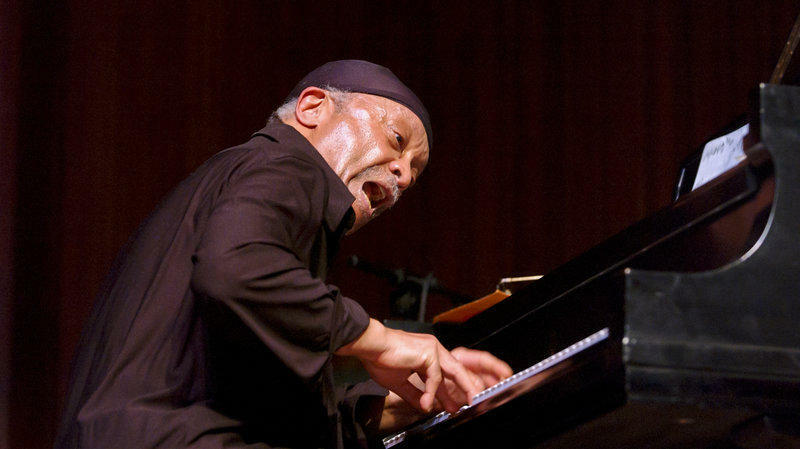 VITALE: For more than 60 years on stage, Cecil Taylor did just that. TAYLOR: When you play, when you perform, it might be the last time, and so you got to do it. (SOUNDBITE OF CECIL TAYLOR'S "JITNEY NO. 2") Transcript provided by NPR, Copyright NPR.